If you happened to stop by Sweet Shoppe Designs or read my new release email/blog post over the weekend, you may have seen that I am the Sweet Shoppe Designs Featured Designer for the second half of August, which means thru the end of August, you can snag my brand-new Block Party Vol. 2 Templates for FREE with any $10 purchase at Sweet Shoppe Designs. Pretty sweet deal, right? In addition to designing a new product, one of my responsibilities as the SSD Featured Designer was to put together a video featuring a top ten list about anything I wanted. 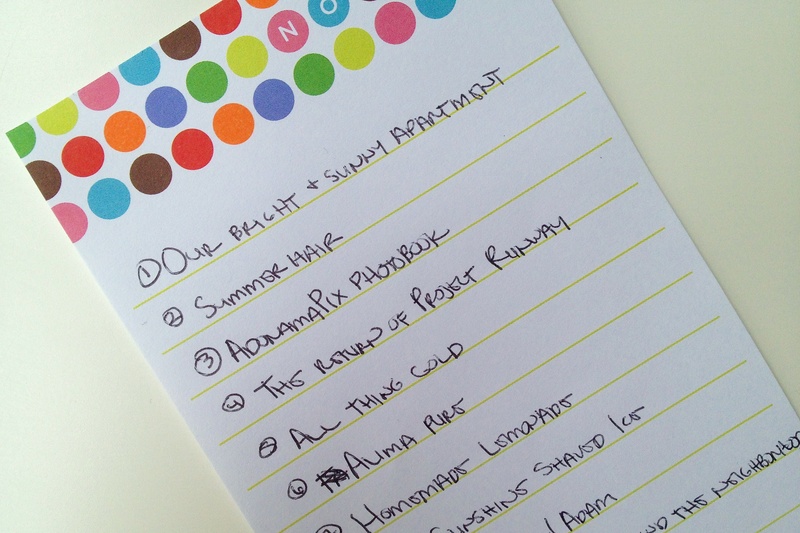 Since I’m no stranger to lists, I decided to use my video as a chance to do a little in-person sneak peek of my August Faves 2013 list. I know, me doing a Faves list? Try not to die of shock now. But I figured since I don’t usually explain much about my Faves on my Monthly Faves layouts, I thought it would be fun to share a little bit more about why my faves are well, faves. I’m not going to lie, I was WAY nervous about recording the video. To the point that I basically left it until the very last minute I reasonably could after nervously agonizing over it for several days. But in the end, once I got going, it was really fun…and surprisingly easy! And since I had such a good time, I thought it might be fun to share a little behind the scenes peek at the making of the video. So here ya go! First, if you haven’t seen my Top Ten video yet, you can check it out below or hop over the Sweet Shoppe blog and check out my complete Featured Designer feature. I shall worn, if you don’t want the Nettio Designs magic ruined, you may want to avert your eyes as you’re about to see me in all my dork-tastic glory. Don’t say I didn’t warn you, haha. Video Fun Fact #1: The “outtakes” at the beginning and end of the video were from my pre-recording test runs, usually about 30 seconds of me saying “test test testing” to make sure the sound worked and the video was zoomed to where I wanted it to be. As you can see I got a bit more creative after awhile – and I know you’re all jealous of my awesome dance moves, haha. Video Fun Fact #2: The main meat of the video was all done in a single take on the first try. Adam asked me if I’d written down talking points or notes or anything and nope, I didn’t, other than my August Faves list seen below. Clearly I get chatty when talking about stuff I love, haha. Video Fun Fact #3: This seems to be the most surprising thing to people who’ve watched the video, but yes, this is pretty much how I am in real life! To give you an idea, whenever I watch the video back, I can’t help but laugh. At myself. Which I’m pretty sure is just about the dorkiest thing you can do, ever. Video Fun Fact #4: Weirdest moment for me while watching the video back? (Well, besides the fact that my voice sounds higher than it does in my head.) Recognizing facial expressions and hand motions as things my sisters totally do. I knew this to be true but somehow seeing it makes it that much more hilarious to me. And now it makes sense why a) we still occasionally get asked if we’re twins and/or triplets, even as adults and b) Adam says the three of us together can be a little crazy. What I always find fun about photography or video, is you can pretty much make anything look good with the right crop. For example, here’s the view you see throughout the video. Just me sitting in a chair against a cream-colored wall. 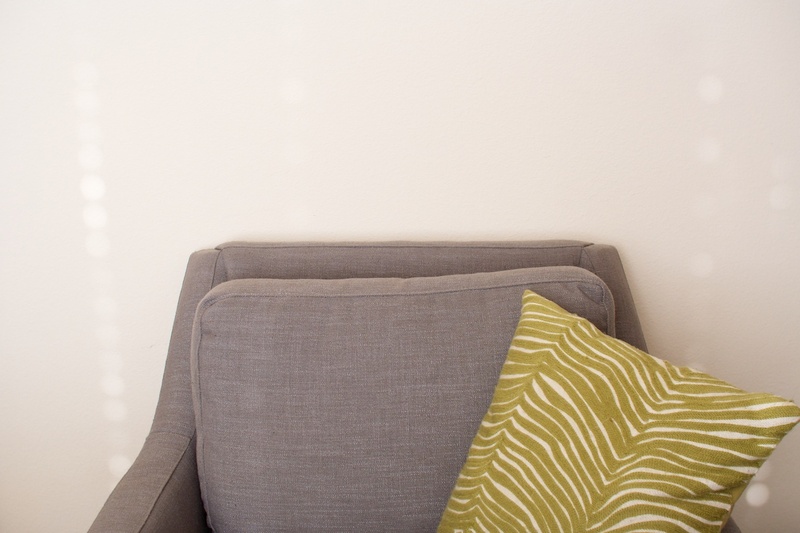 Before making my video, I went on a hunt in search of good light and a blank wall and this was the only space I found in our 1200 sq ft apartment that fit the bill at 4pm in the afternoon. So I dragged a chair from our living room into the master bedroom and squeezed it in between the bed, bathroom door and the ugly electrical grey box on our wall. You can’t tell from this picture but if you open the master bedroom door to the right of the chair, it’ll run firmly into the side of said chair. 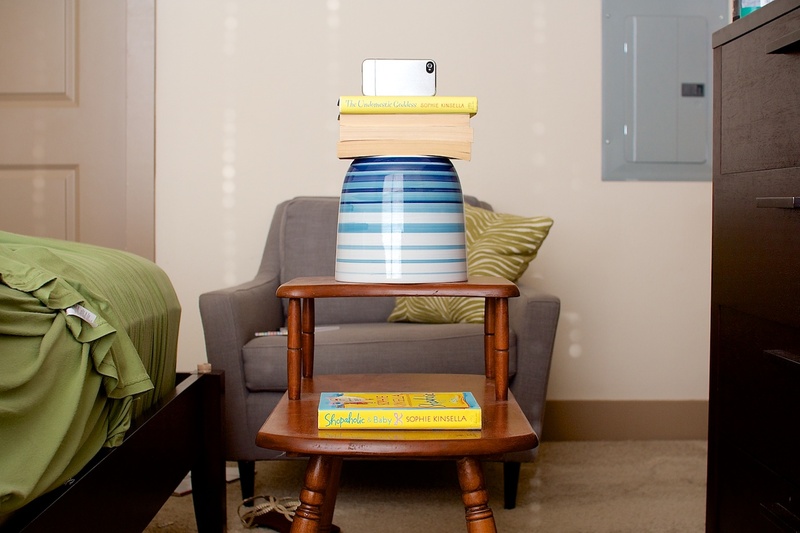 Here’s a bigger picture of my awesome tripod setup. Let’s ignore for a moment the fact that my camera is technically facing the wrong direction in all of these photos. Clearly I don’t have the re-enactment skills of South Beach Tow down just yet, haha. 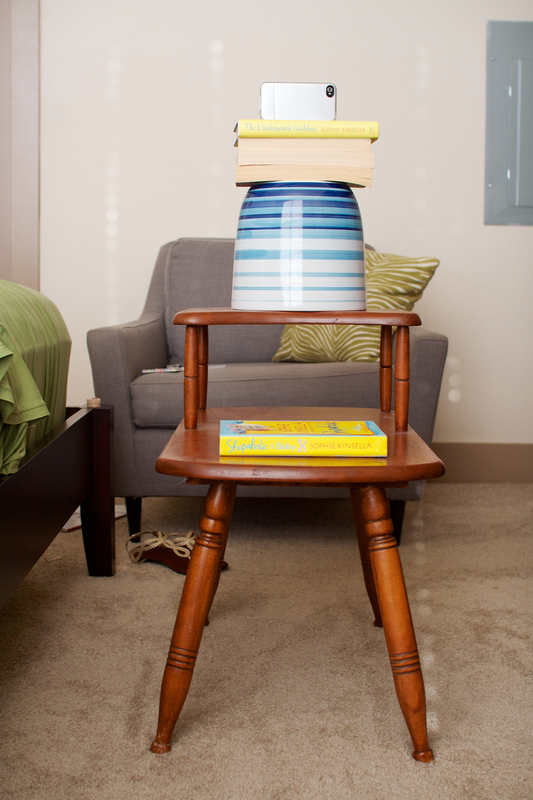 I keep trying to convince myself to splurge on a legit tripod, but really why spend the money when an old side table, an upside-down pot and some books will do? 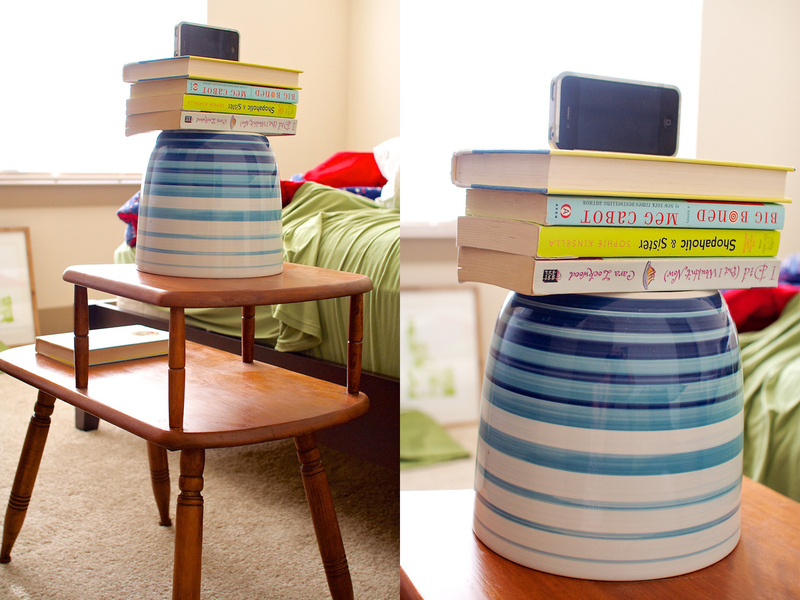 Other items I’ve used as tripods: a ladder, an ironing board and a dresser piled with books. Who said the life of a digital designer wasn’t glamorous, right? Anyway, I hope you enjoyed this little behind the scenes peek at the making of my featured designer video! Be sure to check out the rest of my Featured Designer: In the Spotlight post over at Sweet Shoppe Designs and don’t miss out on picking up my Block Party Vol. 2 Templates for free with any $10 purchase before the end of the month. That was such a great video and so much fun to see you irl. I admire you for being so natural on camera, I’m always so awkward! I recognize your trouble with the electric grey box. I have one smack down in the middle in my kitchen on a wall that could perfectly use some shelves where I could stock my espresso cups that I collect. When renovating the kitchen after the house was flooded, the first thing I said was that the box needed to be moved into a closet, after all the walls were open now, a perfect opportunity. But unfortunately there is actually a law that forbids electrical boxes to be located in a closet especially one with clothes in it. It need to be out in the open and accessible 24/7 in case of emergency. The law even describes who many inches in front of it should be free, in other words, officially you’re not allowed to have a commode or in my case a wooden extended counter top beneath it. We even wrote letters to the State promising we would never cover it up etc; but no go. Haha, thanks Christine! I was really nervous about looking awkward on camera and well, I probably still do with all my crazy facial expressions and hand gestures, haha. That’s a good point about fire code, that’s probably true here as well since there isn’t really anywhere else in the apartment you could put it that wouldn’t be in a closet. I forget not everyone can actually walk into their walk in closets with all their stuff in there. I would totally paint it if we weren’t renting, in fact I’m surprised the apartment hasn’t painted it with as sloppy as their repainting seems to be (like not removing light switch covers when they paint). It is hidden behind the bedroom door when the door is open, which I imagine is why it’s placed where it is. Loved the video, and loved the behind the scenes even more! You did a great job – your are so adorable and a natural in front of the camera. Thanks for sharing the Adorama photo book. I haven’t used them yet, but the quality looked worth the price. I am a huge PR fan too – Dom’s chevron dress was amazing. The pattern making and sewing talent it took to make that piece turn out so perfectly really showcased her skills. I hope she’s there for the win. Thanks Sandy! It always amazes me with PR that you get some people who make sewing anything look SO easy and then there are others *cough* Sue *cough* who doesn’t even know how to thread a sewing machine. So crazy! I totally enjoyed your video! I usually skip online video, but I just had to click play and really enjoyed it. I loved hearing your explanations about each of the faves. I would love to see this in blog post form when you do future fave layouts! Thanks Heather! It was a lot of fun so I’d definitely considering doing something again in the future. Great video! My favorite so far!